Professor Miklós-Thal holds a PhD in economics from the Toulouse School of Economics, France. Prior to joining the Simon School in 2009, she was an assistant professor of economics at the University of Mannheim, Germany, and a visiting scholar at the MIT Sloan School of Management. Miklós-Thal currently serves as a Co-Editor of the International Journal of Industrial Organization and as an Associate Editor of Management Science. Professor Miklós-Thal teaches classes in the areas of pricing and game theory to MBA and MS students. She was named to the school's Teaching Honor Roll multiple times. 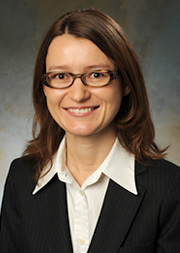 Professor Miklós-Thal's research spans industrial organization, marketing, and personnel economics. She is particularly interested in cartel pricing, pricing strategies in intermediate-goods markets, the impact of various marketing strategies on consumer quality perceptions, and reputational incentives in labor markets. Miklós-Thal’s research has been published in various economics and management journals, including Management Science, Marketing Science, the Journal of Marketing Research, the Journal of the European Economic Association, The Economic Journal, The RAND Journal of Economics, American Economic Journal: Microeconomics, and Games and Economic Behavior.